With Christmas just around the corner, Derwent are encouraging creatives to get their gifts organised nice and early with a selection of the best stocking fillers to make family, friends and colleagues smile this festive season. A selection of the most colourful and creative gifts have been collected to be dropped off in Santa’s sleigh this Christmas. It is said that ‘a pencil and a dream can take you anywhere’ and that’s certainly true of Derwent’s selection of British-made art materials. The Derwent Precision is the ideal stylish tool, ideal for slipping into the pocket of a suit or storing in your art kit. With an instantly recognisable premium metal barrel, the Derwent Precision is ideal for sketchers and creative professionals alike. Made with both style and substance in mind, the Derwent Precision contains a hidden eraser and retractable nib to keep your art clean and safe! Available for £7.99 with refills starting at £3.50. With a crisp winter ahead and artists wanting to crunch through snow to explore postcard style landscapes, the Inktense Paint Pan Set is the perfect friend to keep you creating through December and beyond. Containing 12 bold Inktense blocks and a waterbrush, adventurous artists can create stunning, nostalgic Christmas scenes. The Inktense Paint Pan Set is available for £22.99 with refills available at £1.99. If pencils are more your thing, then heading outdoors can be difficult – especially if you can only choose one range to take with you! Worry no more – the Derwent Pencil Wrap is the ideal piece of portable stationery storage to take your art on-the-move. Compact and light with enough space to hold 30 pencils, the Pencil Wrap ensures you never have to leave your favourite art material behind! 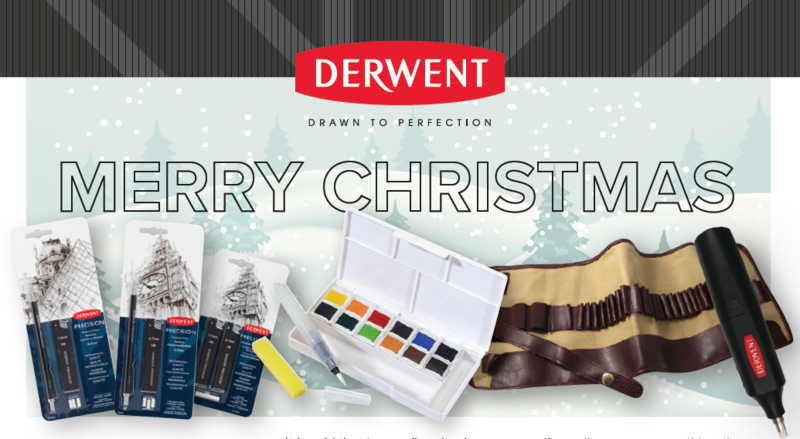 Like Derwent, creativity flows through every one of the artists who pick up one of our products. But even the greatest artists make mistakes. That’s why Derwent’s Battery Powered Eraser is the ever-popular accessory that’s perfect for Christmas. Great for working out those pesky mistakes or adding detail, the product stops the need for messy erasers and painful elbow grease! Pick up yours now from the Derwent website for £5.90. Each set comes with nine eraser tips! Alongside the eraser, no art kit is complete without something to keep your pencils perfectly sharp! The Battery Powered Sharpener is suitable for every pencil range in the Derwent collection and brings each pencil to a point sharper than the Christmas Holly! Fitting four shapes of pencil, the Battery Powered Sharpener has everything you need for detailed art – no matter whether you’re using Coloursoft, Inktense or Studio! If you’re still struggling for ideas, Derwent’s range of colourful professional pencils are the ideal gift – even if choosing a single range isn’t easy! From the waxy, blendable texture of Coloursoft to the moody Graphitint range, Derwent ranges all come in stylish presentation tins containing 12 pencils! Helping to expand an artist’s pencil selection is always a great gift! Starting at £12 and rising to around £30, the pencil tins are a great way to get a budding creative started or expand an experience artist’s repertoire.